Here’s the delicious salad that the Creamy Cilantro-Lime Dressing goes with that I posted earlier today. 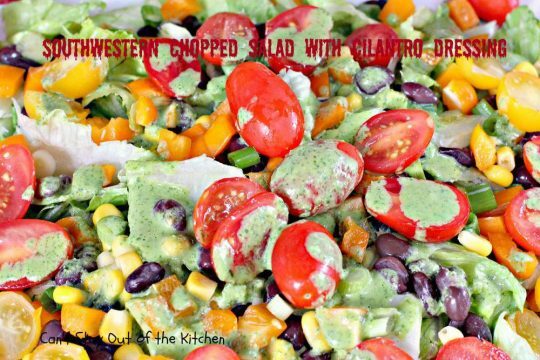 Southwestern Chopped Salad with Cilantro Dressing is spectacular! I LOVED, LOVED, LOVED this salad! The salad dressing is what makes this salad so special even though the salad has a little zip due to the green onions. 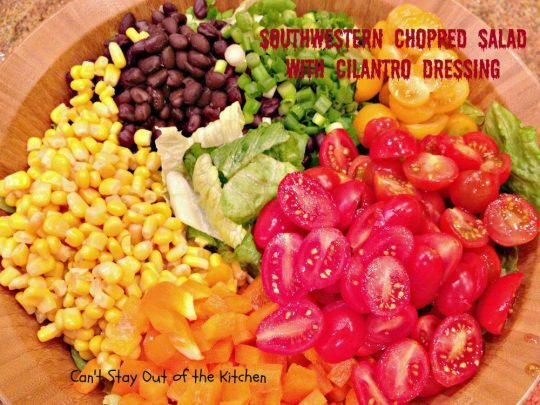 Southwestern Chopped Salad is composed of romaine lettuce, black beans, corn, green onions, orange bell pepper, and two kinds of tomatoes: cherub grape tomatoes, and sunburst cherry tomatoes. It’s really quick and easy to make up and the dressing only takes about ten minutes as well. So in about 20 minutes you can have a wonderful main dish or side dish salad ready for your family including a homemade salad dressing! We served this amazing salad for a company dinner a couple of weeks ago along with Chicken Parmesan Casserole, a Caramelized Onion, Zucchini, Tomato and Mushroom Tart, and a wonderful Parmesan Pine Nut Bread. Southwestern Chopped Salad with Cilantro Dressing was a big hit with everyone. I loved the refreshing Creamy Cilantro-Lime Dressing and can’t rave enough over it, although I did sweeten my dressing recipe with a few tablespoonfuls of honey. I am deeply indebted to The Garden Grazer for this magnificent recipe! I happened to see it on Pinterest and knew it was a recipe I wanted to try right away! I am so glad I did. 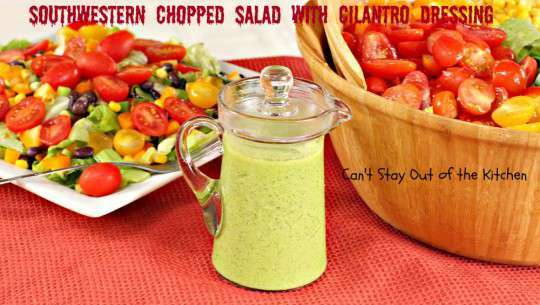 This healthy, low calorie, gluten free salad and salad dressing is marvelous and great for whatever ails ya! The combination of flavors was amazing. This salad is so hearty you can also serve it for Meatless Mondays as a main dish if you desire. 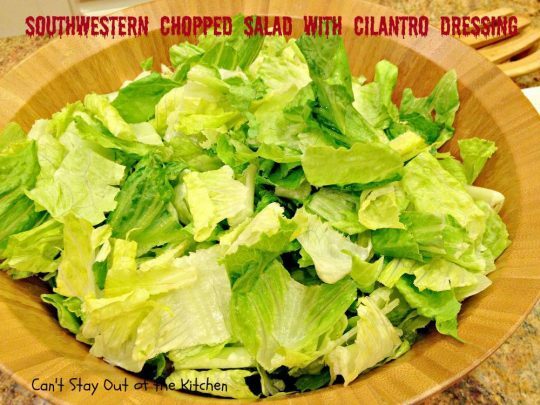 It’s a great salad to eat on hot summer nights when you don’t want to cook, but the ingredients are easy enough to get anytime of the year. Serve this with a loaf of hot homemade bread, or a bowl of my Loaded Baked Potato Soup and you’ll be one happy camper! 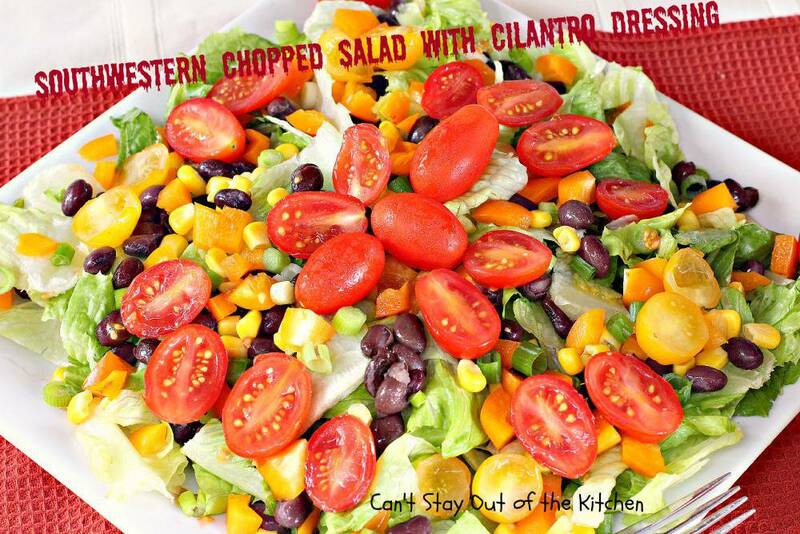 If you’re looking for a great Tex-Mex salad than you’ve come to the right place! Try Southwestern Chopped Salad with a batch of Creamy Cilantro-Lime Dressing and your tastebuds will be bursting with delectable flavors for some time. Yum. 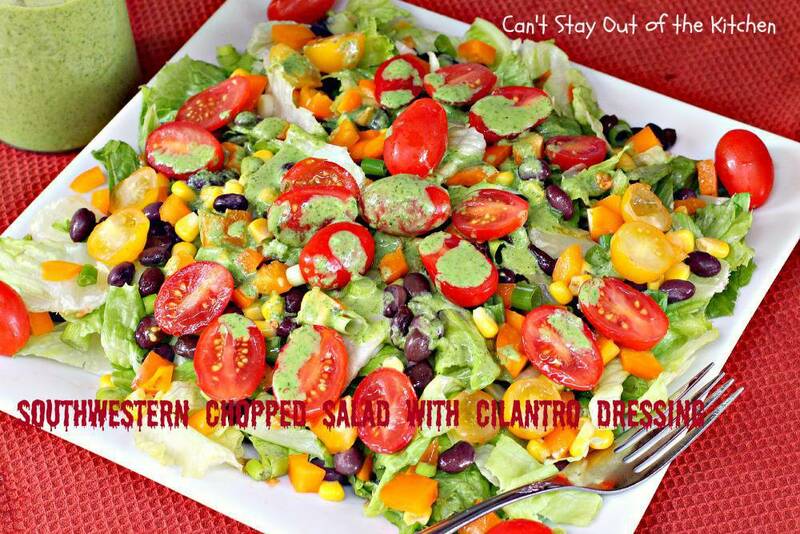 Southwestern Chopped Salad with Cilantro Dressing is a great recipe for Meatless Mondays. Here’s a serving of the salad with the dressing poured over top. Here’s a close up so you can see the gorgeous veggies in this fabulous salad. 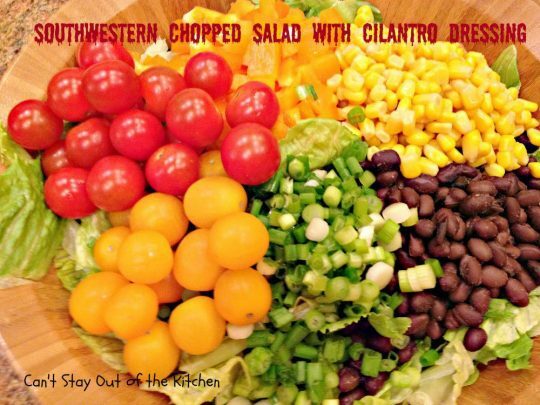 Doesn’t Southwestern Chopped Salad with Cilantro Dressing look marvelous? It sure tastes marvelous! I poured the Creamy Cilantro-Lime Dressing over top. It’s a very festive salad. Here’s the salad before tossing and serving up. This salad only took me about 20 minutes to throw together and that included making a homemade dressing! Place romaine lettuce in a salad bowl. Rinse, drain and pat dry the black beans. 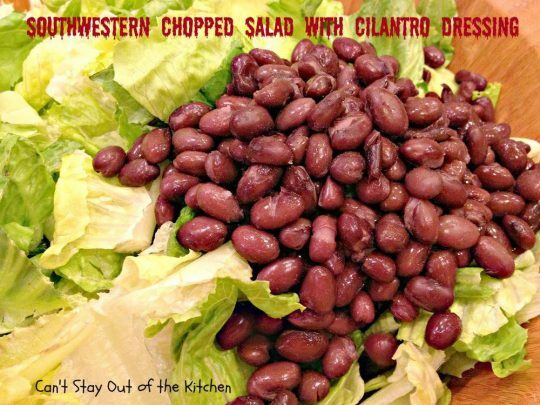 Add black beans on top of the lettuce. Add drained corn or you can use thawed, frozen corn, or fresh corn, diced orange bell pepper, sliced green onions and tomatoes. At first I put my tomatoes on the salad whole, but I didn’t like the way they looked so I sliced them each in half. Here’s the salad with the sliced tomatoes. To make the Creamy Cilantro-Lime Dressing see my earlier post here. To serve: Toss salad and serve on salad plates. Add dressing as desired. 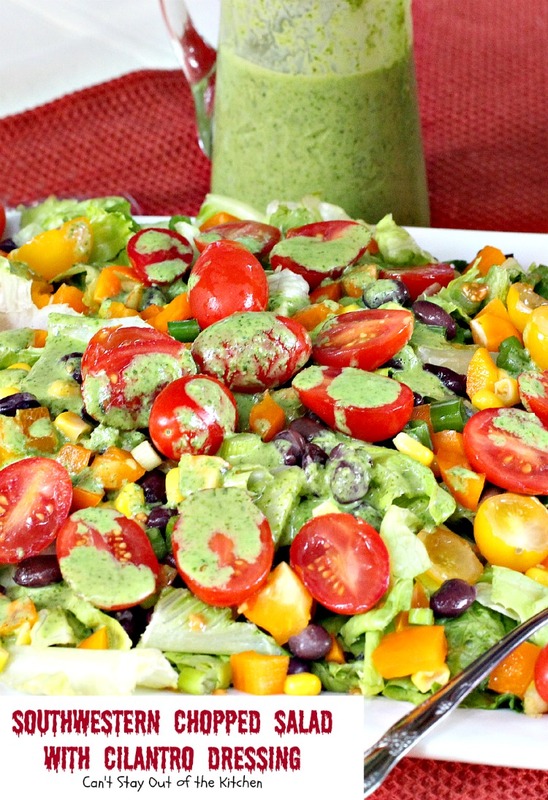 Here’s the Creamy Cilantro-Lime Dressing. Our guests really enjoyed this salad, too. I added a few tablespoons of honey to the dressing, but if you like a really sweet dressing add a few more tablespoons. 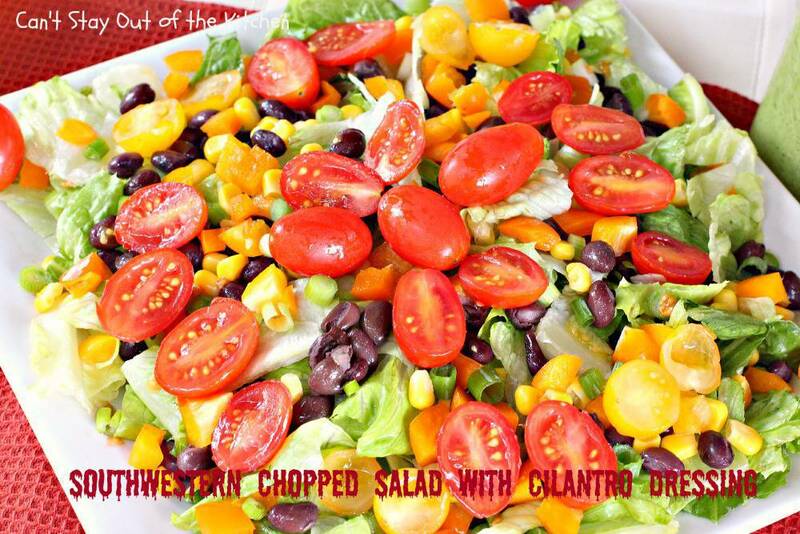 Spectacular salad starts with romaine lettuce, then adds black beans, corn, green onions, orange bell pepper, grape tomatoes, and sunburst cherry tomatoes. This recipe also has a marvelous Cilantro-Lime Dressing. Gluten free. Makes about 1 ½ cups salad dressing. 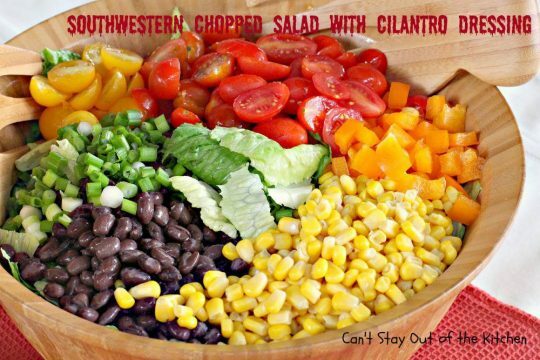 Serve over top of Southwestern Chopped Salad. Recipe adapted from the Garden Grazer. 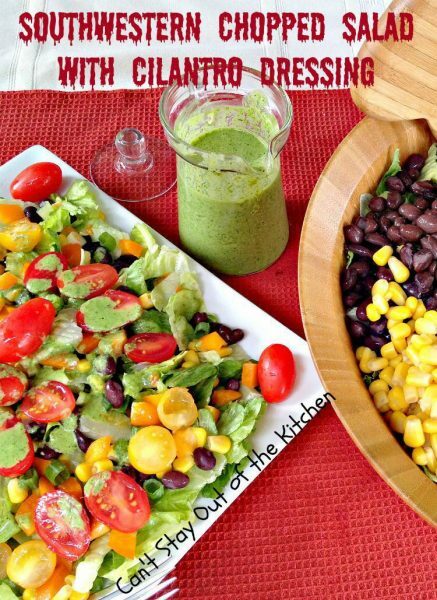 Delicious homemade salad dressing to serve with Southwestern Chopped Salad or any Tex-Mex style salad. 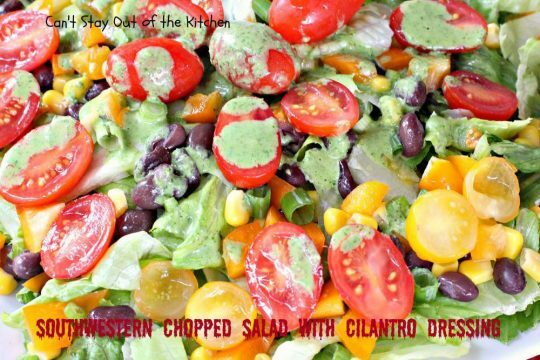 Southwestern Chopped Salad with Cilantro Dressing is yum, yum good! If you enjoy Tex-Mex style salads, you will LOVE this great salad. Teresa, I’ve been meaning to write this comment for over a month. I’m sorry it took me so long. This is the BEST salad. The dressing is just fantastic! I tried it first exactly according to the recipe, and then made it three more times with whatever vegetables I had on hand. This dressing is good with everything. I like adding different types of grilled meat and making it a one dish meal. Thank you so much for sharing this recipe. And a special thank you for the clear way you photograph the ingredients and the step-by-step process. And thank you for being patient enough to explain every step. I’m a beginner cook, and overwhelmed by how much I need to learn. Your website has made me actually WANT to prepare meals for guests! Teresa, for this post I needed a “love” button instead of a “like” button! This salad looks amazing! The colors are gorgeous, and the flavors sound spectacular. Your pictures of the salad are so pretty. I can’t wait to try it. Thank you for sharing the recipe! You are so sweet! It really is delicious. I hope you make it sometime.